Fear can slip silently into our everyday lives until eventually it leaves us drifting through life in avoidance. If you’ve read Outwitting the Devil, you learned that drifting leads to the loss of control of your life. 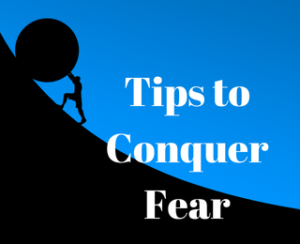 These tips to conquer fear will support you in overcoming what is stopping you from taking action or pursuing your greatest life of contribution and success. Fear is a natural part of human nature. Fear can also make the difference between succeeding and merely getting by. This can be fear of failure, fear of the unknown or fear of change – all of which can keep us from becoming as successful as we wish we could be. If you are experiencing fear in your life, it does not make you weak or incapable. Your experience of fear does not define you. Whether you choose to conquer fear is what truly matters. The first step is determining the acknowledging your fear and determining the source. Just like a starting point on a map, once you know what is causing your fear, you can chart a course to address it. There are many influences we face each day that are outside of our control. We cannot control the media or the thoughts and actions of others. What we can control is what we choose to expose our minds to and how we react to others. Does your environment consistently feed you negativity and dooms day scenarios or does it feed you possibility? Is your environment creative and does it facilitate exploration of solutions or are you more likely to get mired down in the problems? Do the people you are around focus on all the potential negative outcomes or are their minds open to opportunity? Knowing and controlling what is in your power is an important step to conquer fear. Spare time is the breeding ground for fear and worry. Use your spare time to be active, don’t be frozen by fear. By spending your time in physical activity or doing something you love, you will have less time to worry and fret. Productivity is what turns economies and communities around. It also helps to conquer fear. The greatest success stories of our time are of the leaders who took risks, defied the odds, did not stop when hitting their first obstacle and above all else, conquered their demons. As individuals, we all have the right to put strategies into place that will lead us down a path of success, as long as we identify and conquer fear head on. As business owners and entrepreneurs, we need to maintain the freedom to build free enterprises venturing into unchartered territories in search for innovation that will improve society and create jobs. Then collectively, we will make up a stronger society of independent thinkers who will challenge our political and economic leaders to make decisions not based on fear, rather on empowering its citizens to reach their full potential. Our country’s foundation was built on free people, exercising free speech, with free markets encouraging free enterprise. We must unite to conquer fear that will otherwise cripple us and ensure that all of these freedoms continue.